The box can easily be mounted on the interior wall of a barn or other building by first fitting two shelf brackets and then placing the box on the shelf or brackets, rather than trying to hold it to the wall and screw it in place. I toe nail 2 18" 2x4's to the top of a horizontal wall beam if one is present at the desired height. Next, place the box on the shelf and trace the entrance opening on the wall, then remove the box and cut the entrance opening in the wall. If an exterior perch or shelf is desired, it can be attached from the inside by reaching out through the hole in the wall. The nest box can then be placed on the shelf or brackets and secured in place with a screw in the bottom over each bracket. 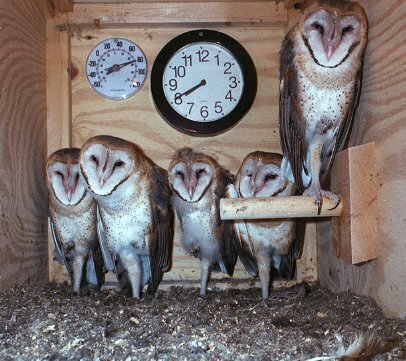 Overheating is common in pole mounted and wall mounted barn owl nest boxes in direct sunlight. Interior nest box temperature is influenced by the building ventilation and the height of the box. Barn hay lofts are well ventilated, but, still trap heat under the roof, especially if there is no breeze. Weatherproofed buildings trap even more heat, with a measurable increase in temperature with each foot of elevation. An inexpensive remote thermometer should be used to check the temperature at various heights before selecting the location for the nest box. Tack or tape the remote sensor to the wall and mount the thermometer at a lower level, limited by the length of the remote wire. Compare these readings to the outside air temp in early afternoon to estimate the amount of heating. In winter, with the sun low in the south, care must be taken in estimating what the summer temperature rise will be at a given height. If overheating is anticipated high on a gable end wall, the box may be placed on a side wall under the roof line. Nest boxes mounted on the rear of buildings where there is little human activity, can be as low as 12 ft from the ground. Barn owls will use boxes on the front of buildings with a great deal of human activity if the entrance is 20 or 30 ft high. Safety seems to be their only major concern. Noise and light don't seem to bother them, as is often claimed. If they think that humans, cats and other predators can't reach them, they don't seem to mind a great deal of commotion below. The owls in our barn nest box never reacted when loud music was played in the hayloft, but did become alert and anxious when I would quietly climb up near the nest box. Trying to sneak up on an owl is a foolish endeavor. The first time I climbed to their occupied box, I tried to hold my breath as I approached, but realized that they could probably hear my heart beat at that distance. Even if working near the nest box is necessary, such as to stack or remove hay, as long as the box is never opened, the owls will likely feel secure. After all, safety from predators is why cavity nesting evolved. 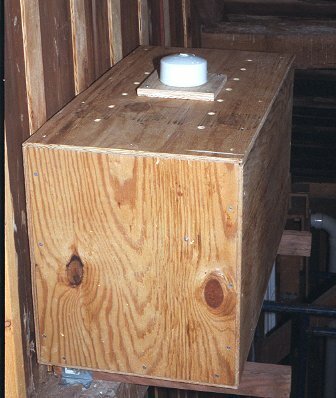 An easy way to mount the interior nest box in an attic is to make a 3/4" plywood insert to replace a removable attic window or ventilator and cut the entrance in the plywood. 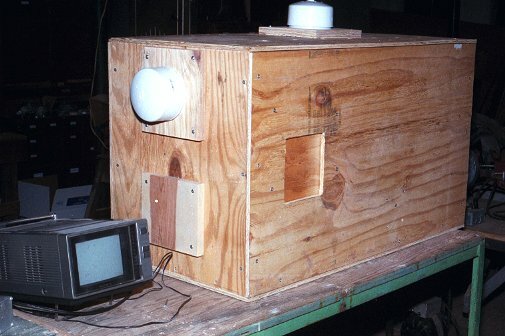 The nest box can then be placed on legs in front of the window. However, be sure the attic box will not overheat before attempting such an installation. There should be two windows or ventilators on the wall so that one will remain when the box is installed. If your roof is well shaded or you use an attic fan and know that the attic does not overheat, this is a very convenient location for running the video cable and enjoying the live owl video downstairs. It is also the safest location to mount the box, not requiring the use of a ladder. However, if your attic is used for clean storage, there will likely be a fine white dust coating everything near the box by the end of the nesting. Any little gust of wind will blow the dust out the vent holes. Also, an active nest box has a strong smell of ammonia. My experience with old plank floored walkup attics is that the smell doesn't enter the house and doesn't persist after the nesting, even if the box is not emptied. When emptying owl boxes after a nesting, I have always found the contents to be quite dry and most of the smell disipated. But, scooping up the pellets and shavings does create another round of dust. The plywood box is 3 feet long by 20 inches high and 18 inches wide. A smaller than usual entrance (5" x 5 1/2") and extra long box provides protection from the great horned owl. The 20" high sides provide a cooler box with better air flow through two rows of 5/8" holes in the lid. The large box also allows the owlets adequate room to exercise, as observed with the nest cam. The nest box is fitted with an interior dial thermometer, visible in the camera image, an interior perch, and a starling and pigeon trap. Two camera ports are provided. The top cam is most useful early in the nesting to view the eggs and very small nestlings. The second cam port in the end of the box is useful as the nestlings become mobile and to view the adults interacting throughout the nesting period. The box is mounted on an interior wall and an opening is cut in the siding to match the 5 x 5 1/2" entrance. The owls do not have access to the interior of the building. An entrance can also be cut in a plywood insert replacing an attic window or ventilator. &COPY; 2001, American Artifacts and Richard Van Vleck, Taneytown, Maryland.